This weekend was a good one for music, even if I do say so myself. The Manassas Chorale (of which I am a member–tenor II, and–full disclosure–my wife Becky directs) ended its nineteenth season with a spring concert of patriotic music entitled “A Star-Spangled Celebration” which was presented to a sold-out house at the Hylton Performing Arts Center on the Prince William Campus of George Mason University. The concert went well, and included arrangements of a number of red white and blue favorites, including “The Star Spangled Banner,” “God Bless America,” “Battle Hymn of the Republic” (in a timeless arrangement by Peter Wilhousky), “Eternal Father, Strong to Save,” and “America, the Beautiful,” in addition to some “new” arrangements and songs such as “Riversongs” (a medley by Joseph Martin), “Thank You, Soldiers,” “Salute to Our Grand Old Flag” (ably voiced by a sixty-voice children’s honor chorus of elementary students selected by their music teachers), “Let Freedom Ring” (written and made popular by Barry Manilow), “A Festive Call to Freedom,” and in recognition of veterans and active-duty military, “A Tribute to the Armed Forces,” in which each branch of service’s anthem was sung. One of the most touching and outstanding pieces as far as I was concerned was American composer Mark Hayes’ setting of Abraham Lincoln’s “Gettysburg Address.” Hayes’ arrangement, paired with his orchestration, enhanced the rhythm, musicality and nuances of Lincoln’s two-minute speech delivered nearly 150 years ago. Singing it gave me chills, and that doesn’t happen too often! The audience for the evening was appreciative and complimentary. We anticipate another good year for our twentieth season. 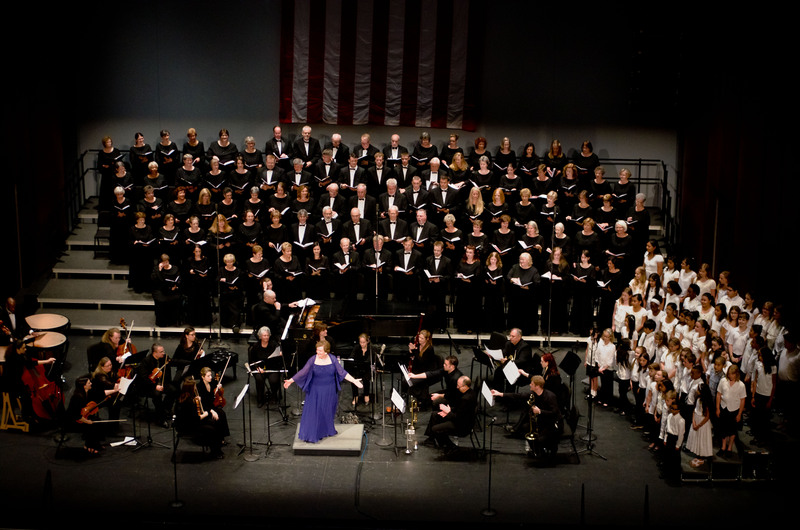 If you are interested in more information about the Chorale or in joining us in the fall (we are an auditioned group), visit the Chorale website at http://www.manassaschorale.org/home.aspx. Thanks to the Manassas Chorale for vibrating my little dots and dashes to life! I wished I could have been there to hear it! I am so grateful for all of the efforts on my behalf. To have my music represented on the program is a wonderful gift indeed! All my best to the singers and to their wonderful director!